Most of the Questions That People Ask Are Answered Below. Contact Us if You Need More Info. The best way to start is with one of our introductory courses or instructional tandem flights designed to give you a taste of real flying. Under radio supervision, you will fly solo from the training hill on day one. The basic techniques of paragliding- launching, turning, landing – are fairly easy to learn. If after your introductory flights, you want to continue with paragliding, the next step is to enroll in our Novice (P2) Paraglider Certification Program which you will learn about glider aerodynamics, meteorology, thermal flying, ridge soaring, flight maneuvers and emergency procedures. We focus on building your launching, landing and flight techniques through intensive training. Paragliding is the simplest form of human flight and is becoming the fastest growing type of foot-launched flying. A paraglider is a non-motorized, foot-launched inflatable wing enabling you to fly. It is easy to transport by way of being compact and light-weight. The wing itself is constructed of rip-stop nylon from which the pilot is suspended by strong Kevlar lines. These high-performance fabrics combined with a growing comprehension of our micro-meteorology have allowed for the development of our incredible sport. As a pilot, you are buckled into a harness and find the sitting position which provides the most comfort. With learned flying techniques you actually fly like a bird, soaring upwards on currents of air such as thermals or ridge lift. Paragliding is about finesse an serenity, not strength and adrenaline. Pilots are as young as10 and as old as 80. You will want to be in good shape as there may be some hiking involved. Being physically and mentally alert and prepared is more important than physical conditioning. To be a successful paragliding student and pilot you need to be able to think clearly and listen well. As new creatures of the sky we are always learning! How long does it take to learn paragliding? You’ll be flying solo within your first few days of paragliding instruction, which is one of the advantages of the sport. However, in order to acquire the basic skills necessary to fly on your own without instructor supervision, you need to take our Novice (P2) Paraglider Certification Program, which generally takes a minimum of 7 to 12 training days and at least 25 flights. During this course, you will complete the USHPA-mandated amount of ground-school time, flights, and flying days, and will learn about high altitude flight, advanced maneuvers and reserve parachute deployment. Whether you complete your training in consecutive days or spread out over several months is up to you, although the more concentrated your training, the better. How much does a paraglider cost? How long does a paraglider last? A new paraglider, harness and reserve will cost somewhere between $3,600 and $5,000. After years of active usage and exposure to UV light from the sun, a paraglider is generally in need of replacement. This of course varies with how you care for your wing. It’s easy to test your lines and sailcloth for strength and thus determine your need to replace your paraglider long before it becomes unsafe. Harnesses and reserves should last indefinitely with good care. Most pilots who get into the sport also purchase a two-way radio and a variometer (which tells you how you are going up or down) for an additional cost. Good used equipment is often available for half as much though it will have a shorter life-span. In addition, because the sport is evolving rapidly, newer paragliders can have significantly better performance and behavior than old ones. Is paragliding the same as parasailing, parachuting or BASE jumping? No. Parasailing is what you do at a beach in a modified parachute tied to a boat, often in Mexico after you’ve had one too many cocktails. You get dragged around the harbor like a sack of potatoes, not like a pilot. Parachutes, both for skydiving and BASE jumping are designed to be deployed during free-fall and to then descend to the ground. 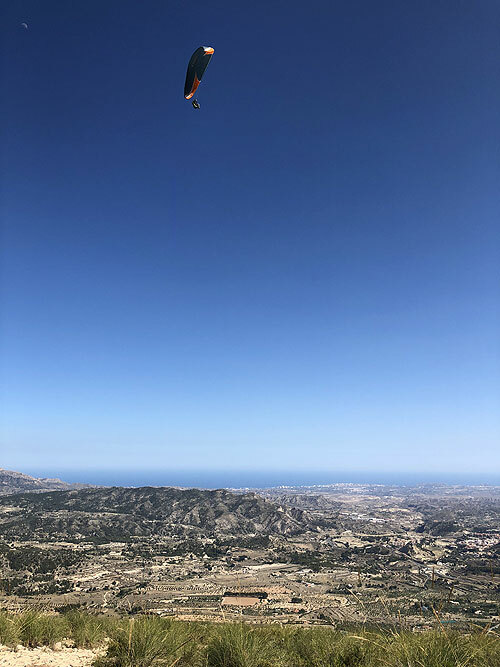 By contrast, paraglider pilots launch from gently hillsides with their gliders already open for flight; if the glider isn’t flying properly, the launch can be aborted before leaving the ground. 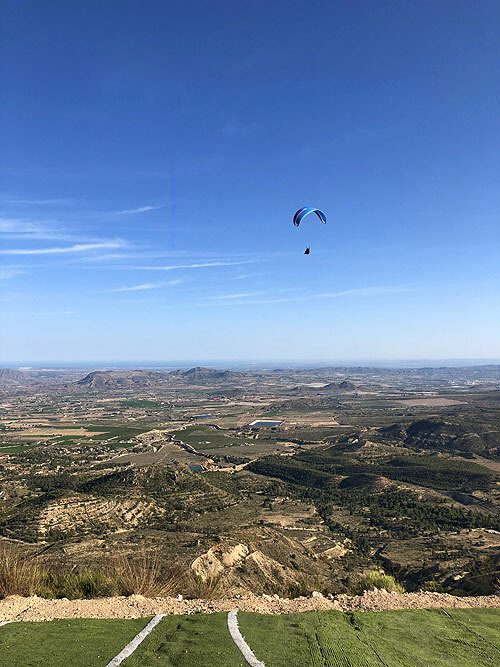 Since paragliders do not have to withstand the stresses of free-fall deployment, they are much lighter and aerodynamic and are designed to go up rather than down. What to know when purchasing your first glider! First, you need to know how to fly. No would-be pilot should purchase a wing before learning at least the basics of paragliding from a well-respected school. Nor should a well-respected school sell just anyone a glider. It is the Instructor’s job to help you select your first wing. 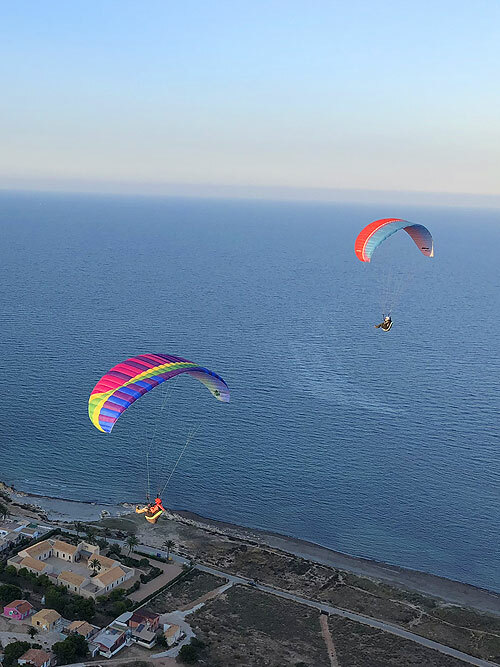 Different paragliders have different characteristics and require different skill levels; we will match the glider to your particular interests, strengths, weaknesses, and skill level. We work very hard to make you a safe competent pilot and continue to guide and support you long after you have received your Novice rating. You may be able to find a glider or reserve cheap on the Internet, but be warned you never really know what you are getting. Supporting your instructor when buying gear supports the local flying community. All lesson and tandem sales are final; no cash refunds. Lesson packages must be used within one year of purchase date. Certification programs are not transferable to another individual. Students on certification programs may join any class where space permits. Reservations are required and are not confirmed until a deposit has been paid. The deposit for the 1 Day & 2 Day Paragliding Lesson is the entirety of the fee; the deposit for the Novice (P2) Program is $750. Lessons may be cancelled with no penalty with 24 or more hours notice. All students will be required to sign a release of liability prior to taking a course or flying tandem. There will be no charge for lessons cancelled due to inclement weather. Partial lessons due to wind or weather will be pro-rated accordingly. Participants must be in reasonable physical condition. Maximum tandem student weight is 240 lbs. (weight limit may be raised only at the discretion of the tandem instructor). If we are unable to complete a program due to an operational shutdown, we will pro-rate a refund or merchandise exchange. There are no refunds or exchanges for students who terminate programs. Absolutely no smoking or dogs at training sites.